Tiger Woods has a share of the lead following an opening 4-under-par 66 in the first round of the Tour Championship in the finale of the FedExCup Playoffs at East Lake Golf Club in Atlanta . Woods made six birdies in a round of 4-under-par 66 to move atop the leaderboard with Englishman Justin Rose. “I played well today,” said Woods. 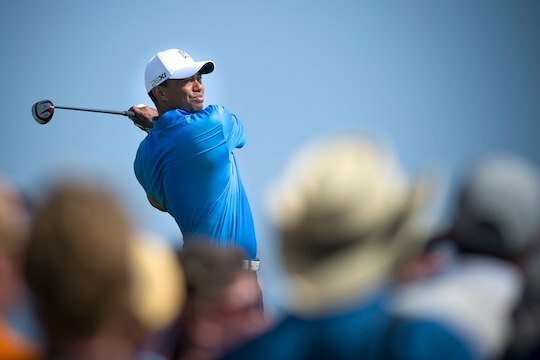 Woods has three runner-up finishes and a win the last four times he has played at East Lake Golf Club and following his opening round made it clear about his liking for the course. “Trouble is just right there in front of you,” said Woods. Americans Steve Stricker, Matt Kuchar, Bo Van Pelt and Scott Piercy carded rounds of 67′s while world number one McIlroy, bidding for a fifth PGA Tour victory this year, and his fourth in just five starts, returned a 69. Rose is a long shot to secure the season-long FedExCup and its US$10-million bonus. The Englishman knows he has to win the Tour Championship and hope that players ranked higher in the points standings finish poorly. Rose was 24th out of 30th entering the championship, while any of the top five – McIlroy, Woods, Nick Watney, Phil Mickelson and Brandt Snedeker – would automatically secure the trophy with victory on Sunday. “Just being here at this tournament is a good feeling,” said Rose. Of the Australians, Adam Scott fired an opening round of 68 to be in a tie for 7th position, with John Senden carding a 2-over-par 70 to share 26th.